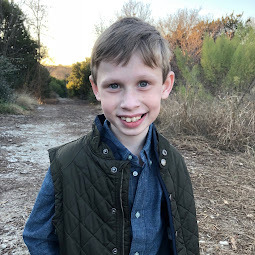 Bennett Brinson Gamel: Fighting Cystic Fibrosis: If I can't have a better MyChart, maybe I can hack the system? If I can't have a better MyChart, maybe I can hack the system? I recently wrote a blogpost about patient portals and how one of the most popular patient portals, EPIC's MyChart, fails patients/caregivers like me. Part of the main reason MyChart doesn't work for me is because it works around the doctor/hospital's needs and not mine, as the patient. So I thought I'd share a few of the ways I wish my hospitals' Patient Portal worked better (see below) as well as share resources I've found that go beyond the Patient Portal and allow me to hack the system so I can get better care for Bennett until my hospitals' patient portals catch up. 1.) Give me initiation access to my clinicians. I wish MyChart allowed me to contact my clinicians when I wanted to, rather than having to wait for them to contact me first. Without electronic access, I am forced to call my hospital's answering service. If I am able to leave a message, the clinician calls me back. About half of the time the clinician calls me back, I accidentally miss the call, which usually means we play phone call throughout the day and sometimes in to the next day. How much easier it would be to be able to contact my clinician electronically, at the best time for me AND the clinician can contact me back at the best time for them. It's a better use of their time and mine. 2.) Give me access to my health records, including Bennett's X-ray and CT scan images. 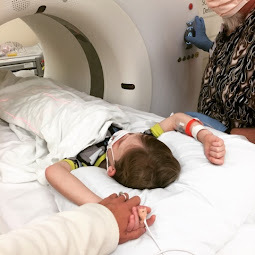 By having access to what my doctor knows about my son's condition, I am better able to ask thoughtful questions and have meaningful conversation during our clinic time. Access to Bennett's records make me a better and more empowered patient/caregiver and gives the clinician more time to do other things as well. I find it potentially harmful not to have access to Bennett's records because without access, there is a chance that I will miss something that otherwise might be considered or caught. Although my clinic gives me a paper handout of our CF Care "Action Plan" after ever visit, this paper easily gets lost at home. Why not have this information online like the way I organize the rest of my life? This is the kind of image I'd like access to electronically. The way I currently hack the system is by taking pictures of Bennett's images from the doctor's computer screen at Clinic. But there has to be a better way. 3.) 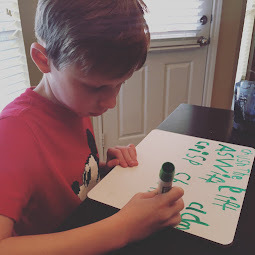 Give me trend data on my son's test results. I wish MyChart showed me how my son's test results have changed over time, particularly with regard to weight. Weight is such an issue for CF patients. I'd like to see how Bennett has been doing and study at what points he was doing better or worse to see if there are more things I can do to help him continue to put on weight and stay healthy. 4.) Allow me to pay a bill online. As is often the issue for patients of chronic diseases, I'm drowning in medical bills. I'd love to pay online and stop the overflow of bills I receive in the mail each month. 5.) Send me appointment reminders. My hospital's MyChart sort of already does this. But what if MyChart actually sent me a Google Calendar or iCalendar reminder that put my appointment right into my calendar? How amazing would that be? This is a free app that I really love because it allows me to scan my prescription bottles in to the system using my smartphone camera and then keeps all the important information in my app database so that I can always have access to Bennett's up-to-date medication list (such as we often need when I visit a new doctor). In addition, CareZone has a reminder feature that tells me when Bennett's prescriptions expire and when meds need to be refilled. I also love that I can indicate through the app when we take a med so that I can actually keep track via percentage of how well we are doing each week adhering to our medication routine. This tracking helps me focus on the one or two meds that we sometimes seem to forget so that we can evaluate if there is a better time or day or better system at home we could put in place in order to make sure medication is given. This isn't an patient portal but it does things that the patient portal might otherwise do - such as contact my CF care team, set up doctor appointments or reordering meds - and so much more!! BetterPHA (the PHA stands for Personal Health Assistant) is a service that patients access through an app. Although the service is not free, BetterPHA seems well worth the price for all that it does. The way that it works is BetterPHA assigns patients their own personal health assistant/live person whose sole job is to make your life easier when it comes to the cognitive burden of healthcare. The sky is the limit on what BetterPHA can do. But the things I've asked my PHA to do include refilling meds, scheduling Bennett's CF appointments, requesting records from Avonlea's pediatrician to update her school records, researching nebulizers, adding my family to the Pulmozyme Co-pay Card program and looking in to insurance issues. BetterPHA is a unique service for both patients and caregivers, CF or not. I highly recommend! This free website is really fantastic for connecting patients together centered around meaningful conversation. I am currently a part of a fabulous and very robust Facebook group called "CF Mamas", the one thing the CF Mamas Facebook group can't do is open the conversation up to other patients in similar situations. So, I really love how SmartPatients allows patients from other communities, such as the IBD/Crohn's or COPD community to share their experiences. 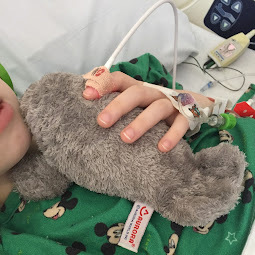 What is it like to raise a child with a chronic illness? How do you create a Parent Advisory Council at your hospital? What are the best pharmacies in the area? These are all questions that could benefit from conversation with a larger community. I'm surprised you can't pay your bills online. I have a few patient portals- one for the allergist, one for the pediatrician and one from the hospital. I can pay bills on 2 of the 3. The hospital one does allow me to read things like a CT scan and ultrasound reports but it doesn't show me the images. I wish it would do that too. I will say one thing I like is that my GP and hospital and other specialists (my gastro for example) are all affiliated together and use the same software so they can pull the results. When I had that ovarian cyst the OB was able to go in and see all my bloodworm and labs and tests from the ER and give her opinion too.